I've been going to the Union Square Green Market on Saturdays for years, bringing my food scraps for the compost collection there, and picking up veggies to eat. 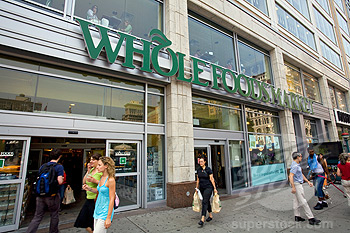 Now, I've added Whole Foods at Union Square to my routine. Along with the food scraps, I tote #5 plastic, usually yogurt containers, and any manner of recyclable plastic bag, and drop it all off at the very user-friendly recycling station at the trendy grocer's exit doors. Since I'm already there, I can't help but do a little food shopping. I've found a nice whole wheat bread and usually pick up some fish, yogurt and whatever looks good that's on sale. Of course, I've shopped at Whole Foods before, but it was absolutely not part of my Saturday routine, mostly because it's crowded and well, you know, the company has its critics. But, the ability to recycle all that plastic that I would have had to throw out has totally changed my attitude about Whole Foods. It's nice to be reintroduced to the market, since it really does carry a lot of yummy stuff. Yes, management is pretty clever, providing a service and gaining a customer. Well, there are worse things a corporation could do to get my business. Spring cleaning and some surprises! 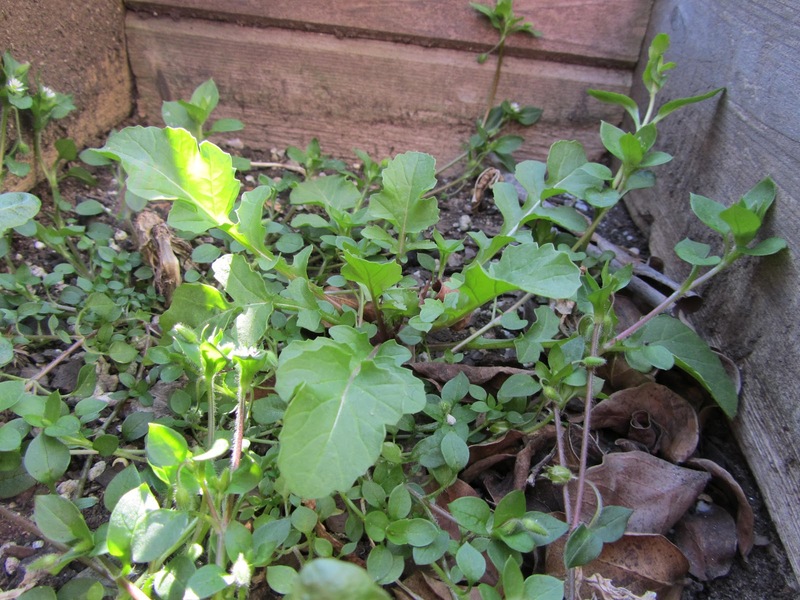 After such a warm winter, weeds are growing like, well, weeds. All of our pots are filled with the tenacious plants, and I spent much of Sunday, pulling them up. But I also found some treasure amongst the weeds. 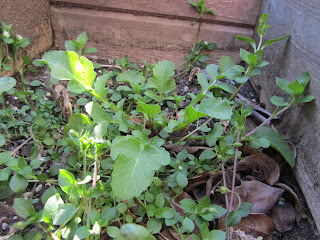 Several arugula plants have sprung up, as has my radicchio - for a third season! I added both to my salad last night for a taste of the great urban outdoors! Urban gardens on a far grander scale than my humble terrace patch are prepping for spring. The High Line, situated on abandoned railroad tracks in Chelsea, is in renewal mode right now. Crews last week began chopping back the layers of wild grasses, skeletal plant stalks, and dried seed heads that define the trendy park’s winter landscape. Known as the High Line Spring Cutback, it's the park’s biggest horticultural event of the year, according to the organization. Friends of the High Line has recruited more than 300 members, supporters, and neighbors to do the job over the next six weeks. Teams of volunteers will cut back 100,000 grasses, perennials and shrubs by hand. And rather than sending the trimmings to landfill, much of the waste will be used as mulch to cover the soil in the High Line’s plant beds. The rest will go to the municipal composting facility at Fresh Kills, to be converted into compost for the High Line and other public parks. If you're itching for an outdoor experience, get out there and pull up some weeds! 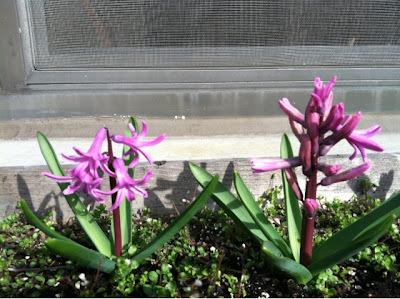 Hyacinths, growing strong, make their March entrance. Despite fluctuating weather, which has included some freezing days, my bulbs are blooming nicely. 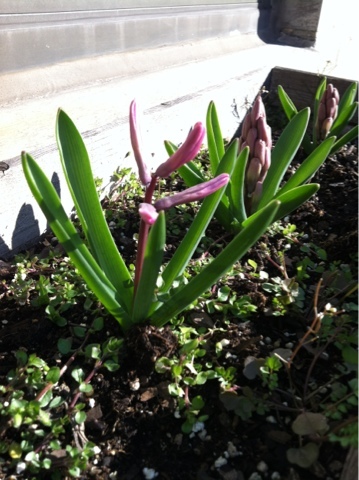 The good news about an early debut is that the planter will be ready for perennials earlier too. Last summer, it took quite a while for the hyacinths to die off, which meant I had to wait till June to put in my impatiens. 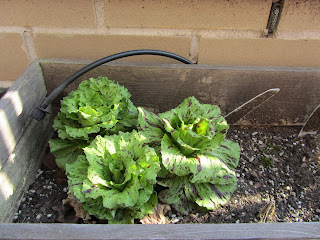 Maybe this year, I'll be planting them in early May. PS. Look what happened in just one day - after saving a draft of this post. The flowers really opened up!